The islands of Greece are the primary characteristic of the country’s morphology and play an integral part in the tradition and culture of Greece. There are 6,000 islets and islands scattered across the Ionian and Aegean Seas, providing a unique phenomenon for the continent of Europe. A large amount of diversity can be found across these numerous islands, such as beaches stretching for miles, sheltered coves and bays, pebble beaches, sandy beaches boasting sand dunes, coastal wetlands, coastal caves, and colored sand of volcanic origin. Visitors can find restaurants and taverns serving local dishes, nightlife, impressive architecture, and much more. The island of Santorini, known in Greek as Thera, practically erupts with charm, with a mythical experience provided by this island phenomenon. The island has been immortalized by painters and poets due to its picturesque sunsets and colorful cliffs. 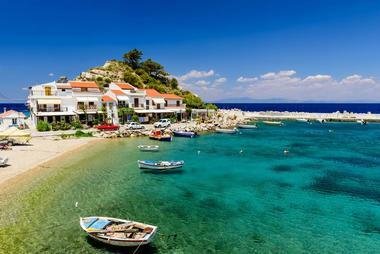 It is one of Greece’s most luxurious vacation destinations. Visitors can relax in an infinity pool situated at the edge of a cliff, offering a spectacular view of the Aegean, or relax in the sun with a refreshing cocktail. A wild landscape of black and red rocks can be seen around the crater at Nea Kameni, located at the caldera’s center. The Greek island of Corfu is considered to be the “Grand Lady of the Ionian,” and is often characterized by a number of mythical images. The iconic mansions in the city and the Liston Arcade are equally as majestic, along with Spianada Square, which is the largest of its kind in the Balkans. Greeks, Russians, French, English, and Venetians all have lived and thrived on Corfu and have each left their mark on the many attractions and sights of the island. The result is an island with diverse culture that visitors will discover in Campiello’s labyrinth of alleyways and with every glass of kumquat liqueur. Turquoise sea and crystal-clear blue waters surround the island of Amorgos, the same waters that provided the name of the movie The Big Blue. The island is hidden away, with untouched timelessness and secret beaches, making it one of the more intriguing of the Greek islands. There is a range of different beaches, from rocky to pebble to sandy, with visitors easily able to find their own little patch of beach that is theirs alone. Amorgos is beautiful and wild with high stretching mountains falling steeply into the clear sea, providing visitors with surprises everywhere they look. 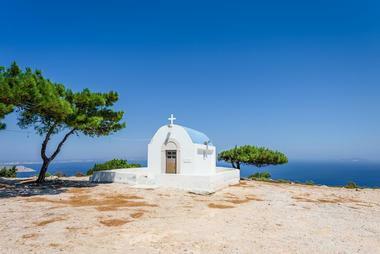 The Greek island of Antiparos is quite picturesque with whitewashed chapels and beautiful beaches. The island is about 30 minutes from Paroikia by way of a small ferry, or 8 minutes from Pounta aboard a car ferry that runs every 30 minutes. 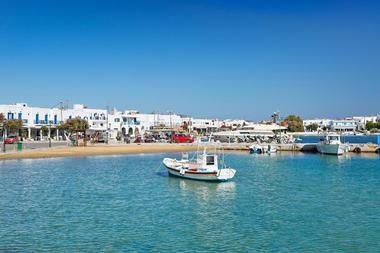 Antiparos boasts a friendly atmosphere and more laidback pace to life. While there aren’t really facilities for watersports available on Antiparos, they can be found in nearby Pounta. Life on the island tends to revolve around the harbor, with the main street leading from the harborfront to the square, taking visitors past several restaurants, tavernas, and shops. Chios is full of medieval villages, wildly beautiful beaches, diverse landscape, and the “miraculous” mastic trees. The island is located along the edge of the beautiful Aegean Sea and is one the area’s most unspoiled and unexplored islands, with hidden treasures, surprises, and secrets wherever visitors look. Around 20 medieval villages can be found in the southern end of the islands, with Mesta and Pyrgi being especially noteworthy. Patrika, Nenita, Armolia, and Vessa are also worth a short visit. The narrow roads of Kambos can also be interesting to explore, with their ornate doors, beautiful arches, and tall stone walls. 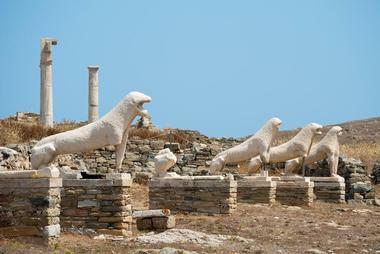 Delos of the Greek islands has been designated as a UNESCO World Heritage Site. 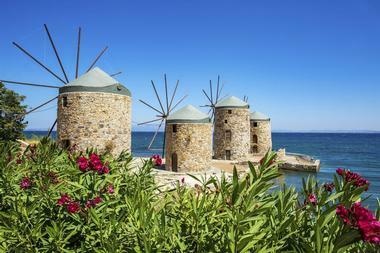 It’s an island of full of history on the Aegean Sea, situated only a few miles from the cosmopolitan island of Mykonos. The island retains its uniqueness in the world, as no other island boasts such a number of monumental antiquities from the Hellenistic, Classical, and Archaic periods. The island isn’t a museum, but rather history itself, and is an entire experience of it own. Delos is the birthplace of immortals of the Greeks, and the island’s sacredness still lives on. The enchanting landscape isn’t home to anyone. Situated between Milos and Sikinos in the Aegean Sea is the small island of Folegandros, an island that features quite a bit of beauty for its small size. Known for its magical charm, the island is thought by many to be one the most beautiful islands of the Cyclades. 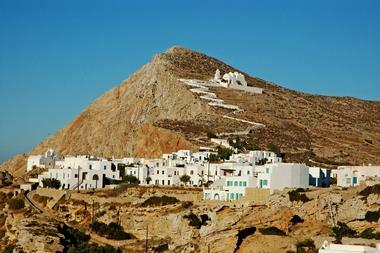 Folegandros features the charming white-washed Hora with an old castle in the medieval era district of Kastro. There is also the Ano Meria settlement, famous for its “themonies” or agricultural complexes. The island’s main town is considered to be one of the country’s most striking. Another interesting attraction is the Aspropounta lighthouse. 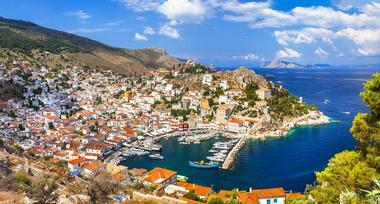 The island of Hydra is perhaps the most impressive of the island within the Argo Saronic Gulf. Due to the island’s close proximity to the city of Athens, Hydra is quite a popular destination on the weekends during the summer months. The town on the island was built along the slopes of a hill near a port and continues to impress visitors at first sight with its elegant stone mansions. One of the best things about Hydra is that no motor vehicles are allowed on the island. All transportation is by foot, boat, or donkey. There are also some beautiful beaches. 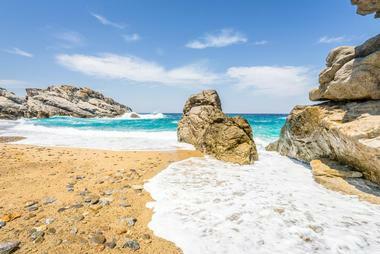 Ikaria may not exactly be one of the most amazing of the Greek islands, but it is certainly wild and rugged. While it lacks the array of beautiful beaches that many tourists look for when visiting islands in Greece, it makes up for them with gourmet food and a modern and lively nightlife. The picturesque village of Arethousa features the Theoskepasti Chapel, carved within a massive rock and photographed by many tourists. 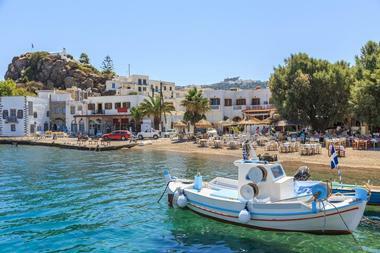 Visitors can also explore the island’s Folklore Museum and Archaeological Museum in Aghios Kyrikos to learn more about Ikaria, while the fishing village of Avlaki offers amazing fresh seafood. The Greek island of Ios is one of the islands of the Cyclades. The island is known for its spectacular beaches, its intense nightlife that draws many young people, and its picturesque village of Chora. Ios isn’t just for parties, however, as it also offers relaxing places away from the noise and crowds. The shoreline boasts several beautiful beaches that consist of emerald waters and soft sand. Breathtaking views of the sea can be found from Chora’s highest point. While the island is popular with the younger crowd, there are still places where families with children can have a relaxing and fun vacation. Kos is one of the largest of the Greek islands. The island’s relatively large size allows for wider scope of events and activities for visitors, which is somewhat unusual for the islands of Greece. Over the years, Kos has become almost synonymous with biking, and thousands of visitors come every summer to tour the primarily flat island by bicycle. The island boasts plenty of natural beauty, spectacular and expansive beaches, traditional festivities, historical monuments, and more. Visitors can also explore the architecture of the island among its many structures, including the famous Asklepieion. The friendly and welcoming people of Kos are another highlight of the island. Lefkada Island is considered to be the “Caribbean of Greece,” and often amazes travelers with the exotic blue hue of the island’s beaches. Lefkada is actually connected to mainland Greece by means of a small bridge, allowing visitors to access it by car, so there isn’t any need for a ferry. The island is an ideal vacation destination for families, friends, large groups, and couples, as there is something for just about everyone on Lefkada. Visitors will find quaint villages around the island, wonderfully colorful beaches, and impressive landscapes, especially in Kathisma, Egremni, and Porto Katsiki. Milos is certainly one of the Aegean’s most exotic islands. It’s one of the Cyclades’ most impressive islands and the place where the Venus de Milo was found. The beaches found on the island are colored orange, pink, and red by volcanic rocks. Kleftiko and Sarakiniko are steeped in pirate stories and feature caves formed by sea erosion, emerald green waters, and white rock formations. The multicolored Mandrakia, Emborios, and Klima with quaint structures cut into the cliffside as well as the exotic beaches and catacombs all make the island of Milos unique. Visitors can board a boat to view the coastline’s kaleidoscope of color. 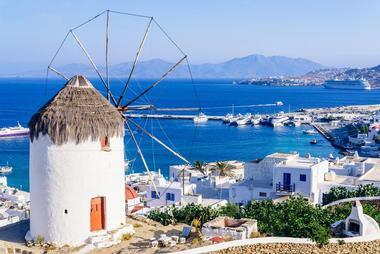 Mykonos is definitely one of the more famous Greek islands, and is also possibly the most popular destination in all of Greece for visitors from all over the world. The cosmopolitan island offers just about everything, satisfying visitors’ appetite for adventure and luxury. Mykonos is consistently voted as a top destination for summer vacations due to its five-star service, luxury hotels, dreamy villas, award-winning restaurants, and amazing beaches. Perhaps one of the most photographed areas of the island is Little Venice. 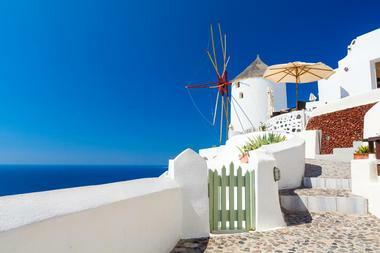 Other major attractions of Mykonos are its white-washed alleyways and the famous windmills. 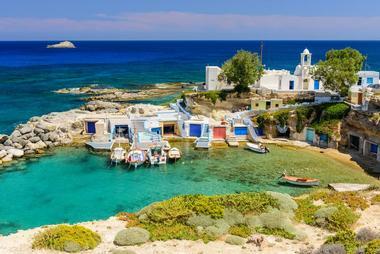 The white buildings and blue waters of the Aegean offer a stunning vista. 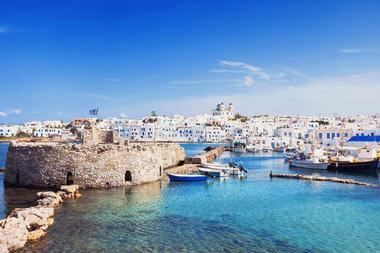 The island of Naxos is the largest of the Cyclades group of islands of Greece. Naxos is a popular destination for tourists and offers plenty of attractions and activities. The island is large enough to not seem crowded even at the peak of tourist season. If visitors want to see everything the island has to offer, they may need to travel around by car. There numerous important medieval structures and ancient ruins, as well as some less significant ones. 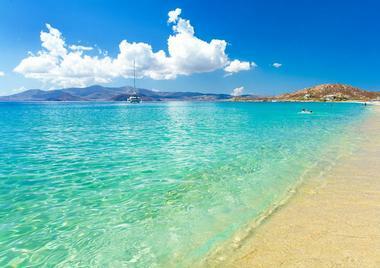 Several beaches can be found near the island’s capital of Naxos Town, also known as Chora. The windy island is perfect for kitesurfing and windsurfing. Paros boasts unmatched natural beauty, Byzantine footpaths that connect traditional villages, beaches with clear waters, and awe-inspiring landscapes. 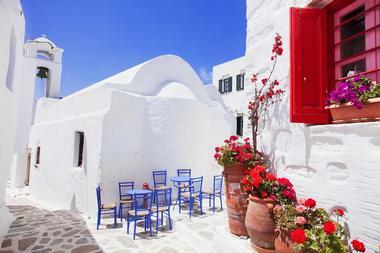 Situated in the heart of Greece’s Cyclades, the island is a beloved vacation destination. 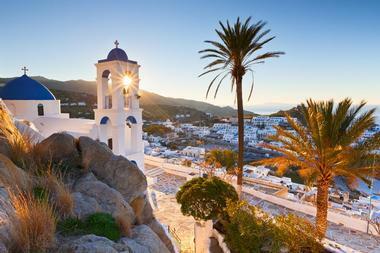 The capital of the island, Parikia, is a beautiful village featuring white-washed homes and neoclassical mansions. Hiking is a great way to discover the natural beauty of the Paros. 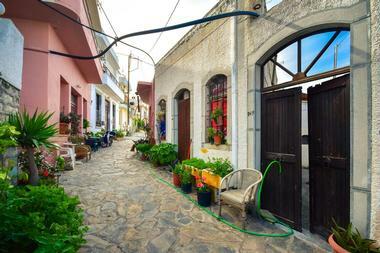 Visitors can walk down strátes as they step back in time to when farmers used these trails to transport goods. The colorful Náoussa village includes the ruins of what was once a Venetian fortress near a small harbor. Patmos is known worldwide as being the sacred island on which St. John wrote the Book of Revelations. It’s also a great place for anyone who loves nature, with its volcanic soil, sheer cliffs, and lace-like coastline. In 1981, Patmos was designated by the Hellenic Parliament as a “Holy Island,” and was designated as a UNESCO World Heritage Site in 1999. 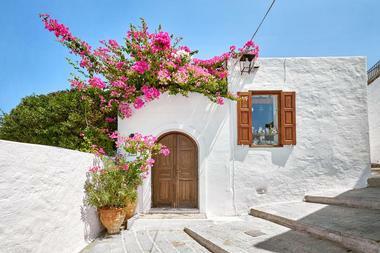 Small white homes can be seen in the Hora area, glittering beneath the Aegean sun, offering a contrast to the area’s two-story mansions. 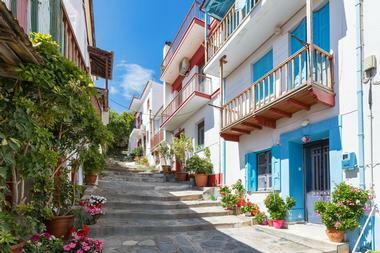 Narrow, historical streets lead to Skala, where visitors will find traditional bakeries, shops, cafe, and restaurants. Tiny Paxi Island is situated in the northern Ionian Sea, located to the south from Corfu. The island has quite a cosmopolitan vibe due to the numerous yachts that moor at its ports during the summer months. Paxi is famous mostly for its amazing and exotic blue beaches. The uninhabited Antipaxi islet boasts some of Greece’s most spectacular beaches. Visitors can visit the islet by boat from Gaios, the island’s capital. Gaios, along with the other seaside villages of Logos and Lakka, boasts of peaceful beach promenades and traditional architecture. 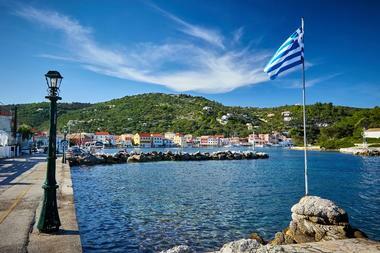 The island is easily visited as a day trip from Parga or Corfu. Rhodes provides many reasons for travelers to come and explore the Greek island, from its medieval old town and the Acropolis of Lindos to the ancient cities of Ialysos and Kamiros to the Valley of the Butterflies and Mandraki Port and much more. The landscape of the island is full of endless attractions, rich history, and generous, eye-catching natural beauty, making it one of the country’s most popular destinations for holidays. Traditional taverns serve local delicacies, and guests will find plenty more to do with the island boasting gourmet restaurants, ruins of ancient civilizations, castles, emerald green waters, and expansive sandy beaches. Samos is one of the most popular of the Greek Islands, distinguishing itself with its lush greenery and amazing beaches. The capital of the island is Vathi, however, tourism on Samos is spread out in its numerous seaside destinations along the coast as well, such as Heraion, Karlovassi, Pythagorion, and Kokkari. The beaches of Lemonakia, Potokaki, Agios Konstantinos, and Tsamadou are particularly amazing with their exotic waters, but there are several other lovely beaches as well that are either completely secluded or well organized. The island is also famous for its wine, which has been produced here since ancient times. Located in the western region of the Cyclades, the island of Sifnos is a beautiful example of a typical Cycladic island, featuring traditional architecture, low hills, seaside taverns, and calm beaches. The island’s most popular beaches with tourist facilities, soft sand, and crystal-clear water are found at the south side of the island. Kastro is the island’s most picturesque village, with amazing views of the sea, stone houses, and narrow streets. Visitors can explore the Monastery of Chrissopighi during their stay as well. The Church of Seven Martyrs, located at the village’s entrance, is the subject of many photos of Kastro. 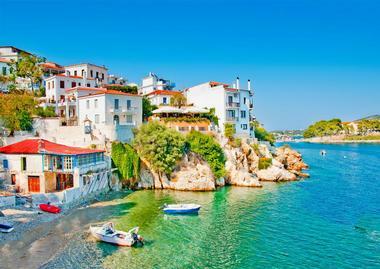 The island of Skiathos is one of the most popular of the Greek islands. Known for its golden beaches, vivid atmosphere, and green nature, the island is popular with both families and youth. The well-known bay of Koukounaries, along with many popular beaches, is situated on the island’s southern side. The impressive and exotic Lalaria Beach of Skiathos can only be reached by boat, along with the island’s medieval castle. The town on the island is where visitors will find most of the activities Skiathos offers as well as a refreshing drink in the evenings. The beautiful island of Skopelos is situated between Alonissos and Skiathos and attracts mostly families and couples looking for romantic vacations. It is also where scenes of the famous Mamma Mia movie were filmed. 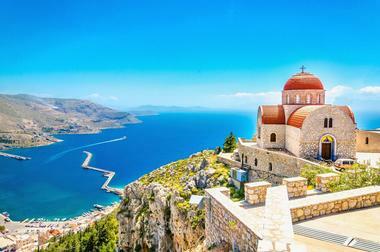 The church from the film is the island’s impressive Agios Ioannis Kastri. Beaches on the island features crystal-clear waters, ideal for spending a relaxing day in the sunshine. The two main villages of Skopelos, Glossa and Skopelos Town, are built atop a hill, offering great views out onto the Aegean. These villages boast their own special architecture. Visitors can also explore other nearby islands from Skopelos. The architecture of Syros Island is more of a more medieval style than it is Cycladic, even though its part of the Cyclades. Ermoupolis, the island’s capital, boasts elegant Venetian mansions, impressive neoclassical buildings like the Apollo Theatre and Town Hall, large churches, and the picturesque Vaporia quarter. The island is a great destination for both families and couples looking for romance, and the beaches of the island are relaxing and pleasant, with several accommodations and tourist facilities nearby. 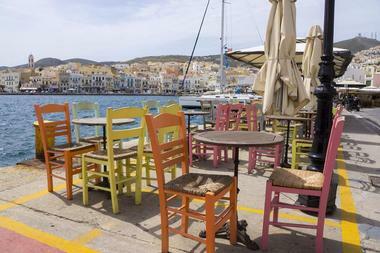 Syros is a transportation hub for ferries, making it easy to explore other islands in the Aegean along with Syros. 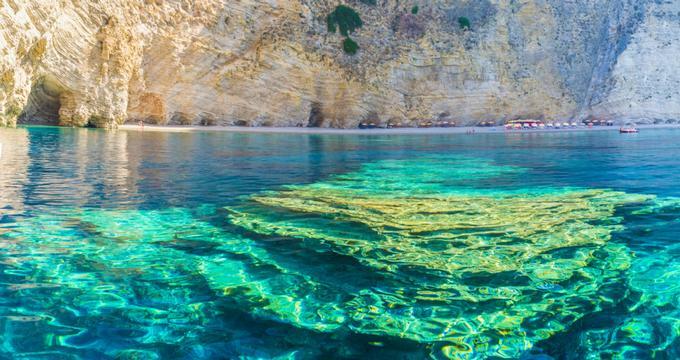 Zakynthos, also known as Zante, is one of the Ionian Sea’s most popular and beautiful islands, famous for crystal-clear waters and an intense nightlife. The most famous of the island’s beaches is Navagio, with exotic blue water and golden sand and is only accessible by boat. 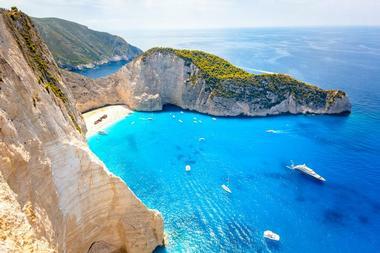 A boat trip to the Blue Caves and Navagio is one of the highlights of any visit to Zakynthos. There are also other great beaches, such as Spiantza, Gerakas, and Vassilikos. 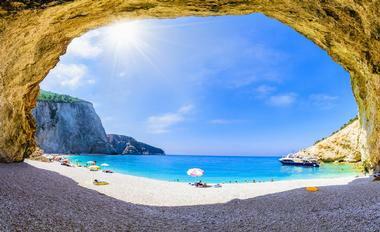 Zakynthos Town features interesting museums, as well as a Venetian castle situated on a hilltop. Mountainous villages dot the island’s countryside, along with old monasteries.